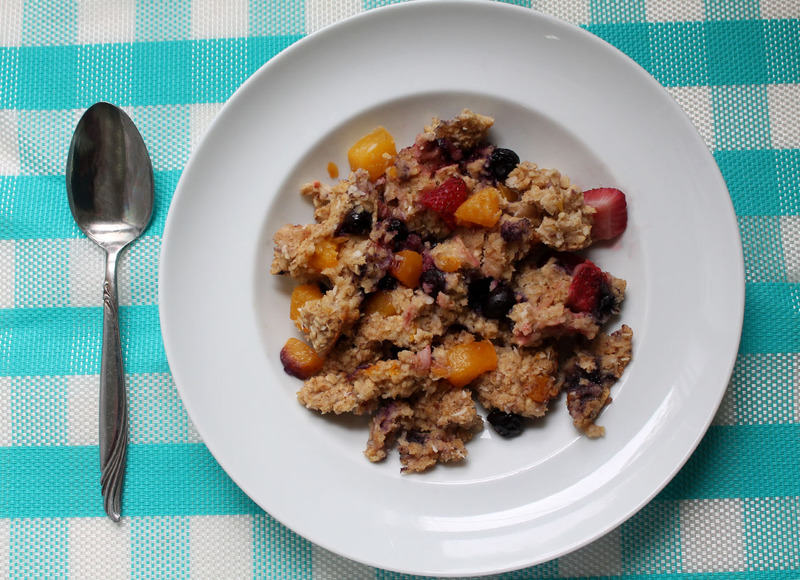 Berry Peach Baked Oatmeal | Live. Learn. Love. Eat. Today I felt like sharing a yummy spring/summer recipe. 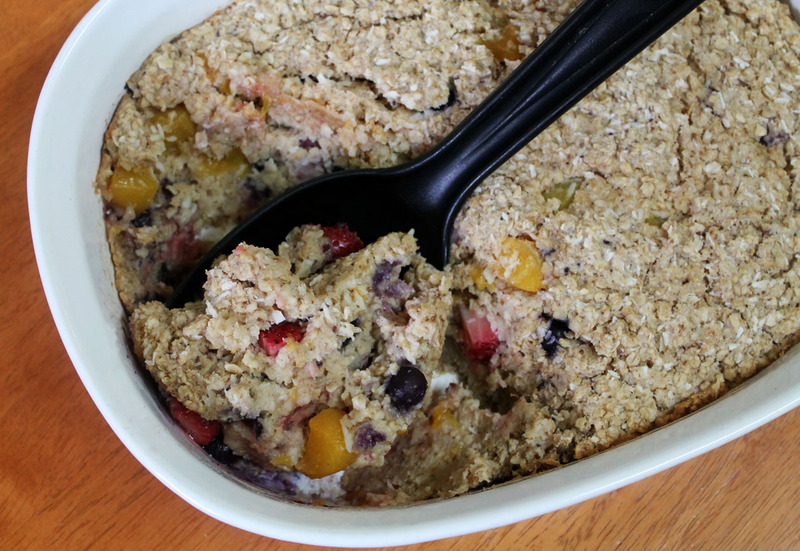 I like to make baked oatmeal on the mornings that I am up earlier than the rest of the family and am looking for a more hearty meal. The sweet berries and peaches make it a delicious way to start the day! Combine the oats, coconut, baking powder, sea salt, ginger, cinnamon, and nutmeg in a large mixing bowl. Whisk together the ground flaxseed and warm water in a small dish and set aside to thicken. In a medium mixing bowl, whisk together the milk, maple syrup, sunflower oil, applesauce, and vanilla and add the flax egg. Stir in the blueberries, strawberries, and peaches then pour the wet ingredients into the large mixing bowl along with the dry ingredients and stir until combined. Transfer the mixture into a 2 1/2–quart casserole dish and place into the oven to bake for 40–45 minutes. 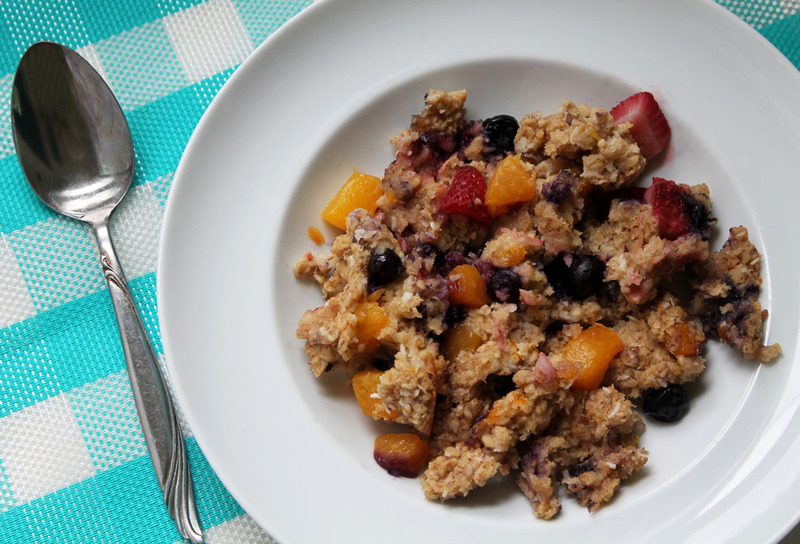 Oatmeal is ready when lightly browned and a knife inserted comes out clean. Serve with unsweetened almond milk and maple syrup to taste (optional). Oh yum … this looks wonderful and so perfect for a spring day! 🙂 Thanks for sharing! Oh my, this looks delish!!! Looking forward to trying it soon, thanks for sharing. That looks yummy! I haven’t tried making baked oatmeal yet. I am the only one in my house that will eat oatmeal, so I can’t really bake it just for myself, I’d be eating it for days! I love anything with oats, so whenever I make something with oats (like oatmeal cookies or granola) I usually end up eating most of it. Yes, those will disappear around here. My daughter helps me eat granola and everyone gobbles oatmeal cookies. It’s just cooked oatmeal cereal that they don’t like. Wow! Thanks so much for the kind comment Beth and congratulations on your pregnancy! How far along are you?